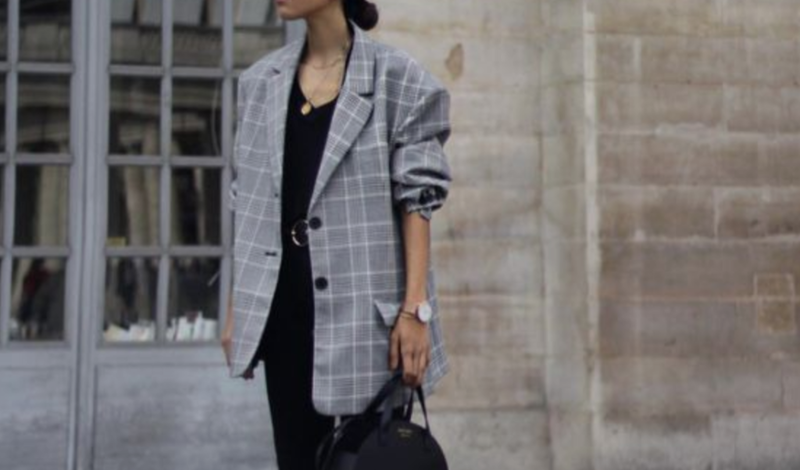 As heritage style comes in (I think we have Stella McCartney to thank for this one) the amount of checked blazers we have seen around has dramatically been on the rise. The piece is so versatile, and fear not there are plenty out there at the moment, so you will 100% find one that is a good fit to you if you decide that you just have to buy into the trend. Below we have put together a short trend edit, featuring three different ways that you can wear the checked blazer this season. We have gone for a casual mix (with the blazer being the piece that smartens everything up) a monochromatic look, with the blazer providing a contrast to the all black ensemble and a layered look, perfect for when the weather really starts to turn. Also another great tip, if you want to buy into the trend, but don't know how pieces will fit into your wardrobe, head on over to Pinterest and give the trend a quick search. You can see what you like and also see what sort of things you already have in your wardrobe that will pair perfectly. We hope you enjoy our little edit as much as we love putting these together for you. All the looks, with notes are below. Firstly lets talk about the blazer. A little bit different from many out there at the moment, this one isn't as longline but more fitted and tailored, which will give a flattering silhouette. This is a great contrast to the loose shirt we would pair underneath. Leave the shirt untucked, so it falls very casually over the cropped cut off jeans. We have added a high neck body to go underneath the shirt for when it gets cooler, but it is up to you whether you would want to wear the extra layer, the look will still look chic without it. We love how the black at the top of the outfit is going to match the footwear pairing we have included. These Gucci Mules are still big, and are super comfortable. The fur trim gives an autumnal feel to an otherwise warmer weather piece. Lastly we have added a pop of colour with the bracelet bag, a must have amongst the blogger community, and a serious trend focused statement piece. We think this look is perfect for a lunch with the girls, or a day shopping, you may even be able to get further wear out of this by adding some pointed pumps, and wearing for a casual dinner date. Now here we have gone for something very modern, and edgy. We love how the blazer here is asymmetrical, which will create an interesting draping detail when worn open. To match the shape and lines of the blazer, we have opted for some black high waisted bell flared jeans. This cut is incredibly flattering and makes a change from the bog standard skinny jeans that we have seen year in year out. For under the blazer we have paired simple roll neck jumper, to give some warmth now that we are coming into colder climates. Again to match up the angular lines of the blazer and jeans, we have added some super pointy heeled boots in, to help create an illusion of a longer longer leg. We have lastly accessories with some revamped retro style sunglasses from Tom Ford, and a super current Fendi bag. We love this look for evening cocktails, and it also gives you a powerful "I mean business" vibe. People won't be underestimating you in this one! Here is our take on layer dressing with the trend piece of the season. Similarly to the first look we did, we are going to be paring a roll neck to give that extra warmth. But this time, we love the idea of a knitted dress and we are going to go one step further and add a loose trench coat over the top of the blazer. Wearing it open will ensure that you can still see the checked detail, but it will be keeping you warm and protected if it starts to rain. You can always take the top layer off and then you still have a super cool, stylish and trend driven outfit underneath. The blazer we have chosen this time for the look is a longline, double breasted jacket to ensure that it pops through from under the trench coat. We have opted for some pointy boots with a kitten heel, which is so on trend right now, and a big slouchy bucket bag to match the hue of the dress. We love how the red tones also really give off the autumn vibes, which is perfect for this time of year.